If you’re a subscriber to the E3 Business Expo YouTube channel, you’ll have seen we’ve recently uploaded a new video. It shows highlights of our recent pre-event training day for exhibitors at the forthcoming E3 Business Expo 2018. The training day was held on 24th January at the Bolton Whites Hotel and was attended by around 60 delegates. The Expo itself will be held on Wednesday 14th March at the Macron Stadium in Bolton. The pre-event session is a unique event, designed to ensure that exhibitors make the most of their attendance at the Expo. As Mubarak Chati, MD of 1 Events Media explains, it’s another example of the company’s desire to do things differently. “As the event host, we’re genuinely committed to making sure that the Expo works for everyone,” he said. “That’s what this pre-event session is really all about: how we can help exhibitors to make a return on their investment. Businesses spend a lot of time, money and resources on exhibitions, so it’s really important that they understand how to maximise their impact. “This training session is an opportunity for 1 Events media to share its knowledge and experience with exhibitors. We’re offering tools and practical pieces of advice that will help them not just with the Expo in March, but with any exhibition-style event. We explain how to plan ahead, what to do on the day and how best to follow up afterwards. The training day delegates represented the great majority of the Expo exhibitors – over 85% of all those with reserved stands. The response was very positive, with many people commenting that it had boosted their enthusiasm and given them plenty of new ideas. Such feedback is always welcomed by 1EM. 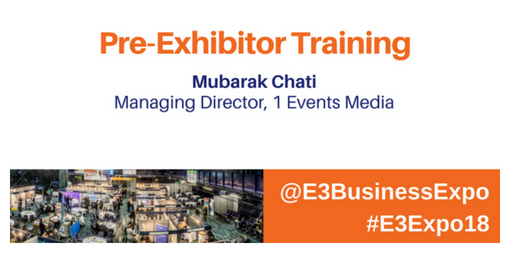 The original idea for the training sessions came about when Mubarak – looking back on 20 years of exhibition experience – realised how few companies came to major business events properly prepared and with a clear strategy. He was determined that E3 exhibitors should come to the Expo knowing exactly how they planned to make a healthy return on their investment. His presentation – highlights of which can be found in the video – therefore focused on the key stages of planning and activity that help to maximise the commercial rewards for exhibitors. He gave delegates an insight into how to plan pre-event promotion, how to encourage visitor interaction, how to qualify leads and capture data, and how to manage the crucial post-event follow-ups. The video can be seen here and photos can be viewed here. This year’s E3 Business Expo is expected to attract record numbers of visitors, so anyone wishing to attend is advised to pre-book to save time queuing on the day.